Outstanding kora sacred circumambulation around one of Tibet's greatest monasteries, on its mountaintop high above the Lhasa valley. 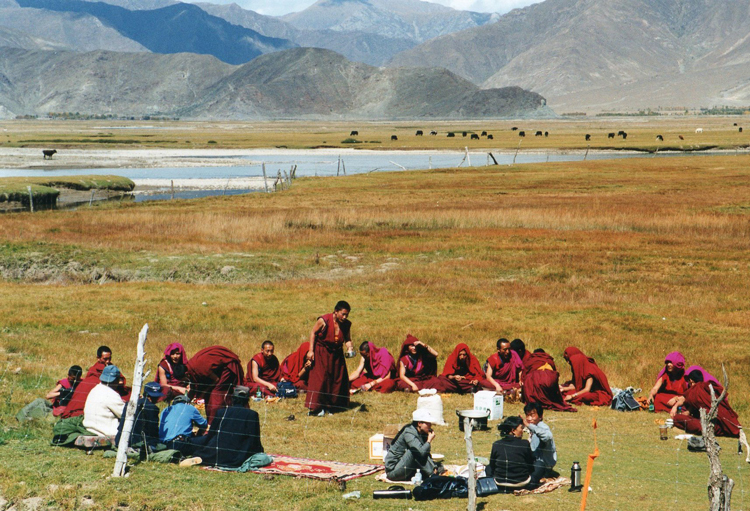 Walk in the company of Tibetan pilgrims muttering mantras, prostrating and sometimes even crawling around the site. The profound spiritual importance of these places, combined with their spectacular settings, make them unforgettable places to walk and think. The altitude here can hurt. Be prepared. 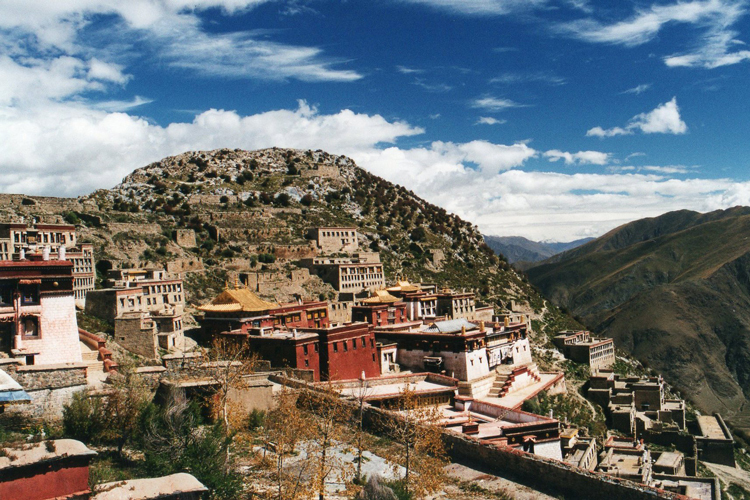 Hidden high on a mountaintop above the Lhasa River, east of Tibet's capital, sits the great Ganden Monastery, rising phoenix-like from its own ashes. 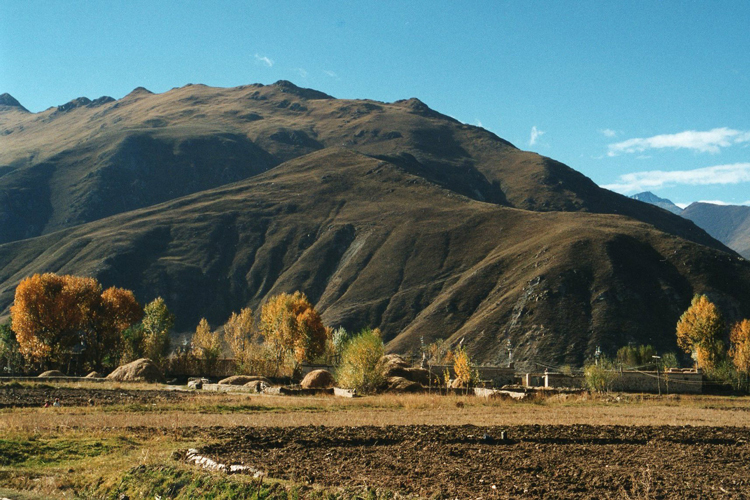 Its setting is extraordinary: nestled around a semicircular bowl at the head of a small side valley between a hill and rough, lonely mountains, the monastery faces down its valley, across to high pasture, dotted with yaks, a small, poor village far below. 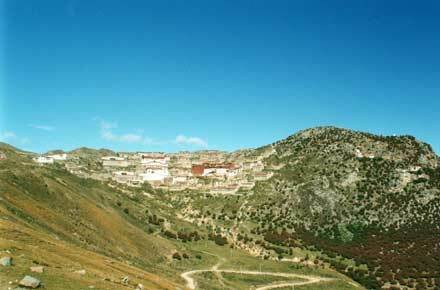 Ganden is hundreds of feet above the Lhasa valley. It is being busily restored, a moving testament to the depth of Tibetan spirit, although it is hard for the non-specialist to know what is faithful and what is Chinese-influenced pastiche. 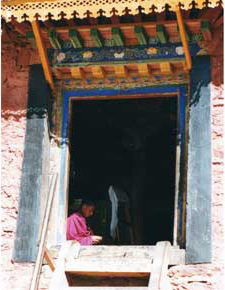 Ganden was one of Tibets greatest monasteries (and mother monastery of the Gelugpa (Yellow Hat) order), until it was destroyed by Cultural Revolution shellfire. (Interesting parallel between the Taliban destruction of the giant Bamiyan Buddhas and Maoists of Ganden both extreme fundamentalists, both deliberately by shellfire.) I still remember seeing as a child a photograph of the ruins of great Ganden: there was nothing left but grey rubble on a barren mountain slope. 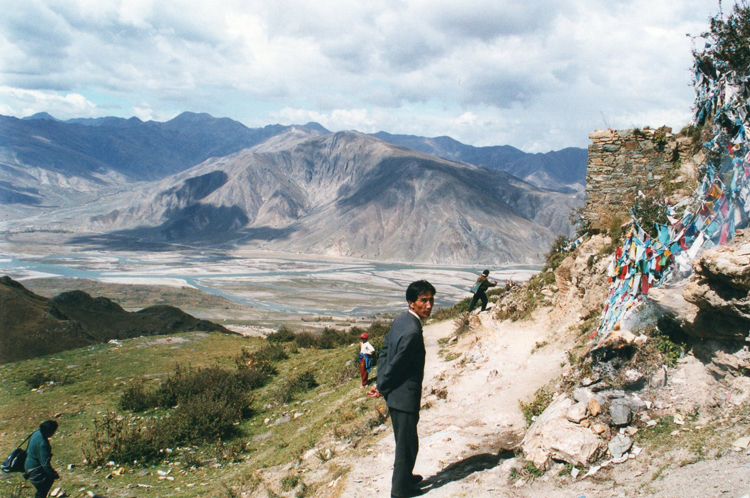 I knew nothing of Cultural Revolutions, Tibet, or even China, but have never forgotten it. The kora starts at a fissure, in the ridgetop and one of the densest, brightest assemblies of prayer flags I have ever seen, an overwhelming display of vivid reds, blues, greens, yellows and whites, each printed with a prayer which is repeatedly dispatched heavenward as the flag flutters in the breeze. Beyond the flags, the full glory of the Lhasa valley opens up, a huge view, cliffs and slopes falling away to wide bottom, with the river rushing between boulders, patches of tough grazing and little barley fields. Hamlets nestle among stunted trees, brightly fading in autumn. Behind, the scree and barren dun hillsides, all crags, of the high, empty plateau. The path edges above precipices and sidles under cliffs, although most of the time it cuts across steep grassy slopes. 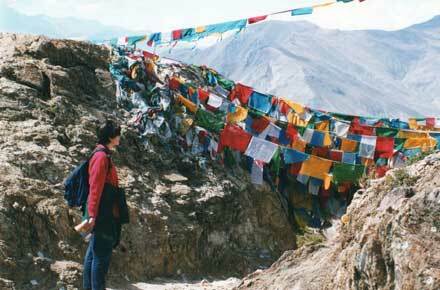 As it swings away from the Lhasa valley, it passes through a notch in the craggy ridge. The path is now on the lee side of the ridge, and small trees crowd the hillside. 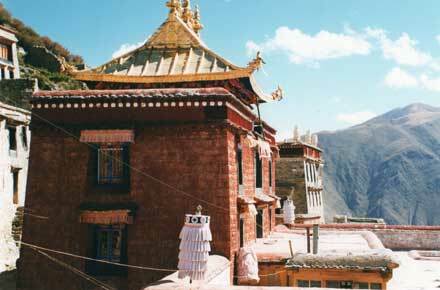 A superb trek into the barren hills of the Tibetan plateau, across to Samya monastery, starts from this monastery. Details to follow. See our Monastery Koras page for detailed practical information. Hidden high on a 4,500m mountaintop above the Lhasa River, some 40km eastward of Lhasa, capital of Tibet, sits the great Ganden Monastry, rising phoenix-like from its own ashes.